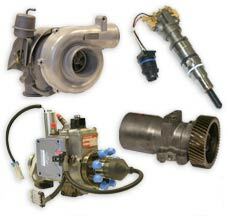 In addition to remanufacturing a complete line of domestic and import diesel engines, JASPER offers a selection of diesel engine fuel and air system components including fuel pumps, injectors and turbochargers. Diesel fuel system components offered by JASPER include high pressure oil pumps like the Bosch Rexroth Pump and the Shepard Pump, the Stanadyne DS and DB2 pumps, along with a variety of Caterpillar Pumps. Every fuel injection pump is thoroughly tested and calibrated on sophisticated test equipment. All Bosch injection pumps are calibrated on a state of the art Bosch 815 calibration stand. HEUI high pressure oil pumps are tested on a custom-built test stand to provide a live simulation of in-the-vehicle operation. Injectors include the HEUI 7.3 and 466, the 6.0 and 6.4, Bosch Common Rail and other popular applications. As a Service Dealer for both Bosch and Stanadyne, JASPER’s Diesel Air and Fuel Component Division employs Associates that have been trained in original equipment specifications and processes. JASPER is a Service Dealer for Borg Warner and remanufactures, as well as stocks, most popular Borg Warner turbocharger applications. JASPER also remanufactures Garrett and Holset applications plus many more. A core balancer and state of the art component balancer are used in the remanufacturing process of every turbocharger. This assures exact component balance in order to assure optimum turbocharger performance and life. In addition to the air and fuel components we offer, JASPER offers accessories for the very popular International/Ford 6.0L diesel engine. These accessory items include heads, FICM (Fuel Injection Control Module) and EGR cooler. Call Jasper Engines and Transmissions, when you’re looking for complete coverage of all your diesel engine needs.